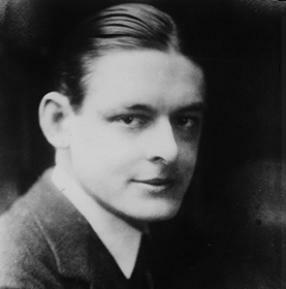 Thomas Stearns Eliot was born in St. Louis, Missouri, of an old New England family. He was educated at Harvard and did graduate work in philosophy at the Sorbonne, Harvard, and Merton College, Oxford. He settled in England, where he was for a time a schoolmaster and a bank clerk, and eventually literary editor for the publishing house Faber & Faber, of which he later became a director. He founded and, during the seventeen years of its publication (1922-1939), edited the exclusive and influential literary journal Criterion. In 1927, Eliot became a British citizen and about the same time entered the Anglican Church. Eliot has been one of the most daring innovators of twentieth-century poetry. Never compromising either with the public or indeed with language itself, he has followed his belief that poetry should aim at a representation of the complexities of modern civilization in language and that such representation necessarily leads to difficult poetry. Despite this difficulty his influence on modern poetic diction has been immense. Eliot’s poetry from Prufrock (1917) to the Four Quartets (1943) reflects the development of a Christian writer: the early work, especially The Waste Land (1922), is essentially negative, the expression of that horror from which the search for a higher world arises. In Ash Wednesday (1930) and the Four Quartets this higher world becomes more visible; nonetheless Eliot has always taken care not to become a “religious poet”. He often belittled the power of poetry as a religious force. However, his dramas Murder in the Cathedral (1935) and The Family Reunion (1939) are more openly Christian apologies. In his essays, especially the later ones, Eliot advocates a traditionalism in religion, society, and literature that seems at odds with his pioneer activity as a poet. But although the Eliot of Notes towards the Definition of Culture (1948) is an older man than the poet of The Waste Land, it should not be forgotten that for Eliot tradition is a living organism comprising past and present in constant mutual interaction. Eliot’s plays Murder in the Cathedral (1935), The Family Reunion (1939), The Cocktail Party (1949), The Confidential Clerk (1954), and TheElderStatesman(1959) were published in one volume in 1962; Collected Poems 1909-62 appeared in 1963.
thid poiem is one of the best i have i have ever read .in facy , eliot forshadows the biginning a new age of decay as i guess that things haven’t been as bad as they are now . i can apply the poem on myself ,my society;even if literature is fiction ,but some times it’s more real than reality. Referring to the title: try the parcival legend! As far as I know it’s a middle- german epic loosely linked to the King Arthur’s epic. In short: While Parcival is trying to become a knight errand he meets the Fisher King (Amfortas), who resides over a dead land and suffers from a mortal wound, but cannot die. As soon as any stranger would show care by asking the king a question, the wound woud heal and the waste land would be restored, and the one who asked would become the new king of the grail. Parcival, who misses his first chance, has to learn, that all his knightly behavior is worth nothing unless he also learns charity. I have started to study “The Waste Land”. I have not already understood about the poem’s titles. Could you give me any hint? water which is one of the four natural elements plays a distinguished role in eliot’s poetry. or constructive depending on its intinsity.In the ‘Death by Water ,’ it is destructive.yet, through out the poem it is constructive;it rather refers to the faith through which the waste land may be reserrected.